Chúc mừng năm mới and Happy Lunar New Year to all! As we approach the first anniversary of the UN's launch of the Decade of Action for Road Safety (2011-2020), I would like to call for further increased cooperation among all of us. We have done tremendous work so far, and much of it exemplifies the great strides we can make when we are working together—private sector companies, public offices, non-profit organizations, and individuals who want to make the road a safer place. Road crashes are largely predictable and preventable; join me in amplifying our efforts and multiplying our positive results! Rio+20: safe and sustainable transport must be included, says UN coordinator - Brice Lalonde, Executive Coordinator of Rio+20, made the case for including road safety and sustainable transport within the framework of new sustainable development goals to be agreed at the Rio de Janeiro summit, goals that could eventually be merged with the Millennium Development Goals. Traffic accidents decline from last year's holiday season -A total of 137 people died and 148 others were injured in 176 traffic accidents during the four days of the Lunar New Year (Tet) holiday between January 22-25, according to the Road and Railway Police Department. On average, 42 accidents occurred per day killing 34 people, the statistics indicated. The number of traffic accidents decreased by 33 cases compared with the Tet holiday last year. The number of dead and injured decreased by 10 and 53, respectively. 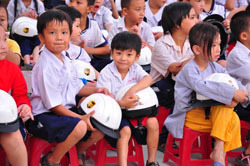 On January 5th, Ho Chi Minh City's Pham Van Chieu Primary School received a Helmets for Kids donation of 1870 helmets from United Parcel Service (UPS), a sponsor well aware of the holiday's impact on road conditions. Volunteers from UPS staff came to the school themselves to provide children with life-saving road safety knowledge. Of equal importance was the education of the adults in attendance, who play a significant role in ensuring that young children wear helmets every day. Helmet wearing at Pham Van Chieu Primary school was typically very low, and this event made helmets appear fun and socially required, which will hopefully increase the students' usage on a daily basis. At Nguyen Tri Phuong Primary School in Dong Nai Province, the majority of students walk to school every day. Most of these students must cross National Highway 1A, which is located 50m from the school and gets an extremely high volume of traffic. 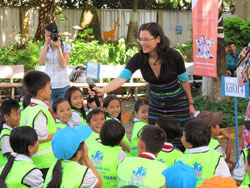 To help these kids, FedEx and Safe Kids Vietnam (implemented by AIP Foundation) carried out numerous pedestrian safety activities and interventions at this school. Traffic lights, rumble strips, zebra crossings, and traffic signs warning of a "school ahead" were installed. 700 reflective jackets were distributed to the students to make them highly visible when they cross the street. Teachers were trained in road safety education and given tools for hands-on teaching. Thanks to these, road safety lessons were given to students, while a traffic safety corner (with four working traffic lights and an intersection) was set up in the playground. Phuoc Long and Phuoc Thanh schools in Ho Chi Minh City's District 9 have been conducting three of AIP Foundation's school programs: Helmets for Kids, Safe Routes to School, and Click on Safety. 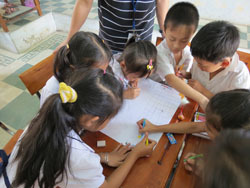 These programs are being funded by Intel Products Vietnam, one of AIP Foundation's longest running corporate partners. In February, students from grades 1 to 3 participated in road safety themed activities outside of their classrooms. The day started off with songs and road safety quizzes to introduce the day's theme. Next, the students painted or did other crafts depending on their artistic preference. After some student performances, judges selected winners and distributed prizes to the proud selected students. The children left their school with smiles on their faces and helmets securely strapped onto their heads. 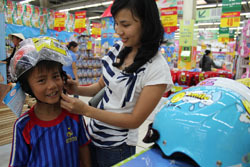 The supermarket chain Big C approached AIP Foundation in January to take part in the child helmet campaign. Thanks to their involvement, additional informational flyers were distributed and more families were reached through three full pages pages in Big C's catalogues. One million catalogues were distributed nationwide, in addition to banners which were hung in the stores and their parking lots from January 26th to February 12th. Big C is calling this communication campaign the "Big C For Kids' Safety" program. It also includes discounts on the retail prices of many child helmets, including Protec Tropical Helmets. New Years Accidents Claim 24 - More than 20 Cambodians died this past week in traffic accidents that took place over the Chinese New Year holiday. Sok Nob, director of the Interior Ministry's legal bureau, said this number was a decrease from last year's Chinese New Year period, in which 29 were killed and 210 were injured. Students who recently received helmets and helmet use training from the Helmets for Kids program were in February led through an additional activity meant to reinforced their new road safety knowledge. Riding a bike, crossing the street, and wearing a helmet were all covered, with help from the VJ of My TV, a TV channel popular among Cambodian teenagers. Students competed for prizes in games and quizzes about road safety. Teachers and parents were also involved in discussions and Q & A sessions. 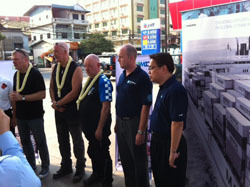 Motorcyclists including Danish Ambassador to Cambodia Mikael Hemniti Winther arrived in Phnom Penh after driving from Bangkok in the Go4 Charity Ride. This trip raised funds for a 10 month school-based road safety program called Helmets for Kids which is being run by the non-profit AIP Foundation. A launching ceremony will congratulate the bikers and kick-off the school program. Located along dangerous National Road 2, the students of Prey Sandek School risk their lives daily to get to school. Thanks to the support of Go4 Charity Ride organizers and participants, 484 primary school students and 31 teachers and staff members will receive donated helmets free of cost, and be taught valuable road safety lessons by AIP Foundation staff. The U.S. Centers for Disease Control and Prevention (CDC) donated 516 helmets to students and teachers of Sandann 1 and Bun Rany Hun Sen Phum Thom primary schools. These low helmet wearing rates are endemic throughout Cambodia, with preliminary research showing that only 8 percent of passengers- including children- wear helmets. It is for this reason that the US CDC decided to step in with their support. "The US CDC is committed to work in partnership with the AIP Foundation to collect information that will help us to evaluate the project. If successful, we hope more Cambodians will wear helmets." said Ms. Dianne Syrvalin, US Foreign Service Officer of US Embassy in Cambodia. In addition to the provision of helmets, Helmets for Kids provides basic road safety and helmet use education to students and teachers, and instructs parents on the importance of helmet use. This February 28, billboards went up throughout Phnom Penh promoting passenger helmet use and the campaign's helmet-heart logo. With the radio spot and the television commercials being broadcasted at high frequency, the campaign is getting high exposure. In addition, 3,000 flyers have been distributed to educate motorcycle drivers and passengers about helmet wearing in order to increase motorcycle passenger helmet use throughout Cambodia. New "protection" for motorbike taxis - About 150 representatives of motorcycle taxis in Bangkok and nearby provinces filed a petition complaining they were being extorted by police and military officers demanding protection money. A son of Deputy Prime Minister Chalerm Yubamrung, Wan, will be assigned to coordinate with police to protect motorcycle taxi operators from extortion. On January 11, AIP Foundation representatives co-hosted an event entitled "Commemorating a Year of Work Toward 100% Helmet Wearing: The Way Forward" with the Department of Disaster Prevention and Mitigation (DDPM), Ministry of Interior. The event, attended by roughly 300 government officials, NGO staff, corporate representatives, celebrities, foreign diplomats, journalists, students, and other road safety stakeholders culminated in the signing of the first ever Memorandum of Understanding between DDPM and AIP Foundation. Mr. Wiboon Sa-nguanpong, Director-General of DDPM and Mr. Greig Craft, President of AIP Foundation, committed to a close collaboration to support the Thai government's goal of reaching 100% helmet use nationwide. AIP Foundation was honored to welcome the Deputy Prime Minister and Minister of Interior of Thailand, Mr. Yongyuth Vichaidit who gave the opening speech. Uganda: Police move to reduce road carnage - The police has decided to acquire ambulances and medical teams to assist with road accident victims. The number of people who died in road accidents has increased from 2,734 in 2009 to 2,954 in 2010, which represents an eight per cent rise. A six month helmet campaign that will run from January to June 2012 was launched in Kampala with a series of workshops for boda boda drivers from different districts in Kampala city. Members of the United States Centers for Disease Control and Prevention (CDC)'s Division of Unintentional Injury Prevention joined GHVI to start up the campaign. On January 18th, the workshop was held for 100 boda boda operators. They were trained in safety regulations and legislations, current statistics, the importance of wearing a helmet, correct helmet use, and helmet quality. All participants received a free helmet, distributed by GHVI's Lotte Brondum and Automobile Association Uganda (AAU) and Uganda Helmet Vaccine Initiative (UHVI) patron Mr. Mutenda. CDC and GHVI, in collaboration with ICCU, carried out helmet observations before and after the workshops, and measured the gained knowledge through pre and post questionnaires. Results from the helmet observations include a helmet use increase from 42% (pre-workshop) to 61% (post-workshop) at the intervention stage (Kamilo) compared with a decrease from 44% (pre-workshop) to 21% (post-workshop) at the control stage (Busega). A radio based campaign will be run during these six months, as the baseline study highlighted radio as the main channel of communication, followed by peers and family members. The radio spots will be aired in 6 radio stations in both English and Luganda, and have been tested with the main target groups. According to research conducted by the Injury Control Center Uganda (ICCU), the reasons most frequently reported for the low helmet wearing rate are that they are too hot, heavy, and unaffordable. After an attempt to develop a regional standard was abandoned, the government under the former Minister of Transport John Nassasira approached the Uganda Helmet Vaccine Initiative (UHVI) for support in the revision of their helmet standard, which had been deemed inappropriate. In October 2011, the first Technical Committee meeting took place in Uganda, and GHVI's Dr. Terry Smith provided technical assistance in the process of revising the Ugandan National Bureau of Standards' draft helmet standard. A helmet testing laboratory, further technical capacities, and future plans were also discussed. 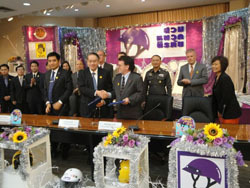 In February 2012, the drafted standard, which is an adaptation of the GHVI-developed MCH1 helmet standard, was approved by the National Standard Council. Starting now, it is the official standard for all Ugandan motorcycle helmets. This will help develop and provide high quality and safe products for motorcycle riders, and allow police officers to better enforce existing helmet wearing legislations. A communication plan will be developed to announce the new standard and explain what types of standards are now required of riders and Uganda. 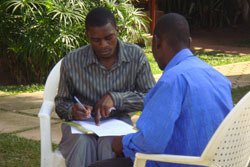 UHVI will support through workshops and communication activities. Fundraising for a testing lab is underway by the Bureau. As Uganda continues to develop economically, road safety stakeholders will encourage a later transition to the EC22 helmet standard.